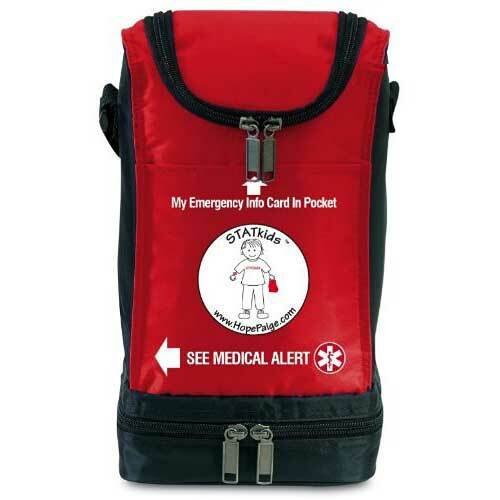 The STATkids insulated lunch bag provides a customizable health alert for school lunch time. An important feature is its clear display window on the side of the bag that holds a customizable card (included) that identifies your child's health concerns when the risk is at its highest...during mealtime. It also has a pocket on the front that holds an emergency information card (included). It has a separate zippered compartment at the bottom that holds snacks, cookies, keep-warm items or emergency medication, a secure zippered closure at the top, and it fits easily into a backpack. The insulated 70 denier nylon bag is high quality and durable. The zipper makes it easy for independent kids to open and close themselves, and the top handle is perfect for small hands. Measures 6-1/4” W x 11-1/4 ”H x 6-1/4”D.